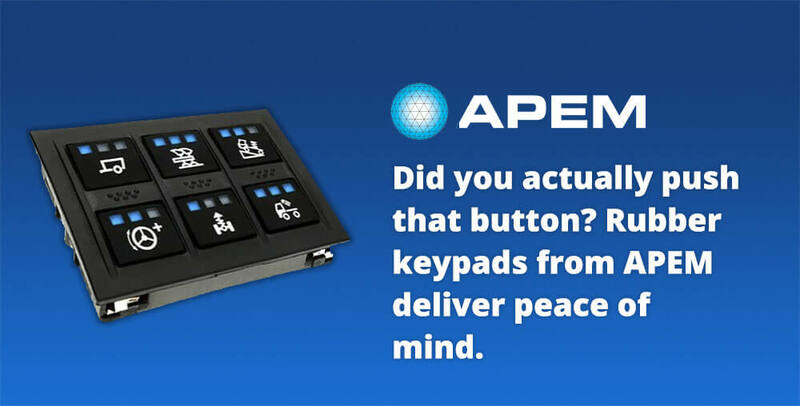 Give Users Peace of Mind with a Rubber Keypad from APEM » Electronic Salesmasters Inc.
Did you actually push that button? Wonder no more with responsive rubber keypads from APEM. In our touchscreen-covered world, people have gotten accustomed to tapping and re-tapping a screen because they’re not always sure their input got through. That might be fine for consumers, but there are certain situations where operators need to know that they’re actually activated a button: farm machinery, road vehicles, aerospace, and defense. Rubber keypads are a great, low-cost solution for these scenarios. Rubber keypads have a great three-dimensional tactility. APEM provides customization options for the keypad design, as well as the level of sealing (all the way to IP69K). Rubber keypads are truly versatile, and can do as much or as little as you want. We are honored to serve as a manufacturer’s rep for APEM. For over 65 years, APEM has been a leading manufacturer of high quality miniature and industrial switches, offering one of the broadest ranges of products in the industry. APEM’s portfolio, comprised of an expanding range of HMI products, includes switches, joysticks, indicators and keypads.